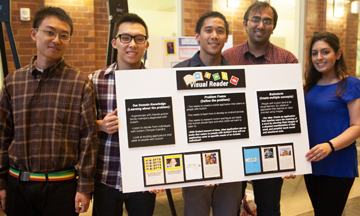 This spring 108 students from various schools across the UC Irvine campus participated in the very first Autism AppJam, presented by the Center for Autism & Neurodevelopmental Disorders of Southern California and directed by informatics assistant professor Gillian Hayes. 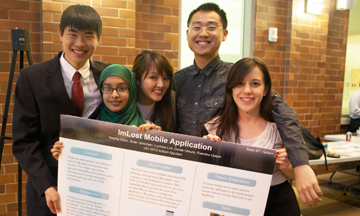 Over the course of two weeks, 20 interdisciplinary teams, each with five to six students, developed mobile applications designed to improve the lives of children and/or adults with autism spectrum disorder. Nine industry judges, including representatives from Blizzard Entertainment, Google, IBM, the Irvine Unified School District and Yahoo, evaluated the apps based on their relevance to autism, uniqueness, creativity and usability, among other criteria. Allows users to touch a word in a presented reading passage and see a visual representation of the word, to help teach children the relationship between text and the physical world. If the user taps on the word “happy,” for example, happy faces and images of happy people appear on the screen. The framework behind this simple concept can be applied for readers at any level. ImLost addresses a security issue in the autism community. While lost and confused, it is often difficult to call for help and communicate one’s location. ImLost presents a simple one-button interface that allows lost individuals to notify emergency contacts via text messaging, and to relay real-time GPS information. 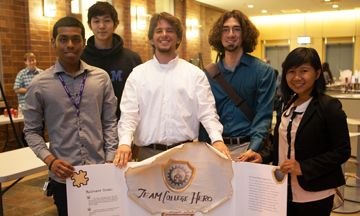 College Hero is a visual task management iOS application. Via a questionnaire, it assists college students with the executive function — the set of mental processes that involve activities like planning, organizing and managing time. The app’s pre-made questions and its built-in templates help create different types of tasks based on priority. The app features a configurable interface, allowing users to customize colors, sounds and profile based on their individual preferences.